This spacious two-storey townhouse in a private complex is ideal for young professionals, small families, downsizers and investors. It offers a great low maintenance home that is presented in good condition. The interior layout is smartly appointed, with a separate carpeted lounge and tiled dining area. All of the three bedrooms have built-in wardrobes and ceiling fans, the master bedrooms with Air-conditioning and walk in wardrobe. There is also a modern tiled built-in kitchen which adjoin the dining area and covered outdoor entertainment area with a grassed section and external side gate access, internal laundry and a second downstairs toilet. There is a single lock up garage with storage space plus an additional car parking bay alongside the lock up garage. This secure and supremely easily maintained property puts you in the right spot to get the most out of Mitchelton, and it's only 8km to the Brisbane CBD. 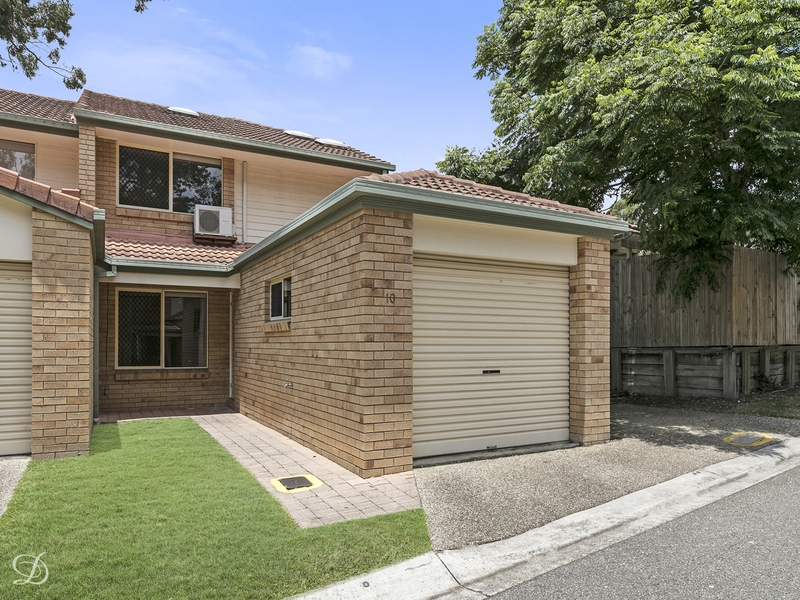 This private setting is within a short stroll to bus and train transport, as well as schools and nearby cafes. • Lots of storage and single lock-up garage and extra parking bay.